Dimensions 1.20 by 6.50 by 9.60 in. A world of "smart" devices means the Internet can kill people. We need to act. Now. Everything is a computer. Ovens are computers that make things hot; refrigerators are computers that keep things cold. These computersâfrom home thermostats to chemical plantsâare all online. The Internet, once a virtual abstraction, can now sense and touch the physical world. All computers can be hacked. And Internet-connected computers are the most vulnerable. Forget data theft: cutting-edge digital attackers can now crash your car, your pacemaker, and the nationâs power grid. 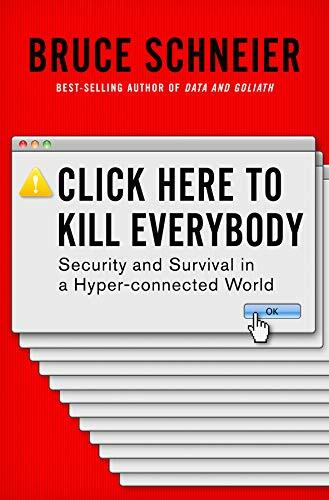 In Click Here to Kill Everybody, renowned expert and best-selling author Bruce Schneier examines the hidden risks of this new reality. From principles for a more resilient Internet of Things, to a recipe for sane government regulation and oversight, to a better way to understand a truly new environment, Schneierâs vision is required reading for anyone invested in human flourishing.